Cover to the April 8th, 1989 issue of TV Guide | Copyright 1989 Triangle Publications, Inc. 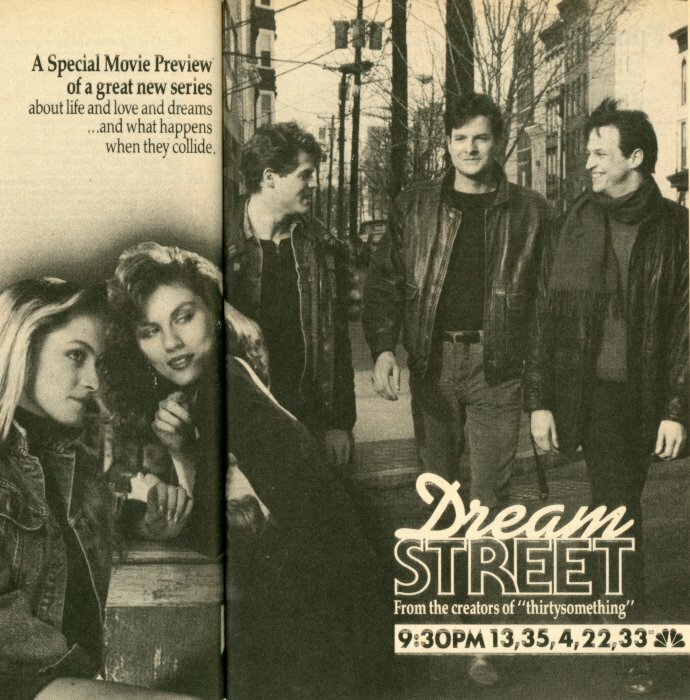 Ad for Dream Street on NBC | Copyright 1989 Triangle Publications, Inc. 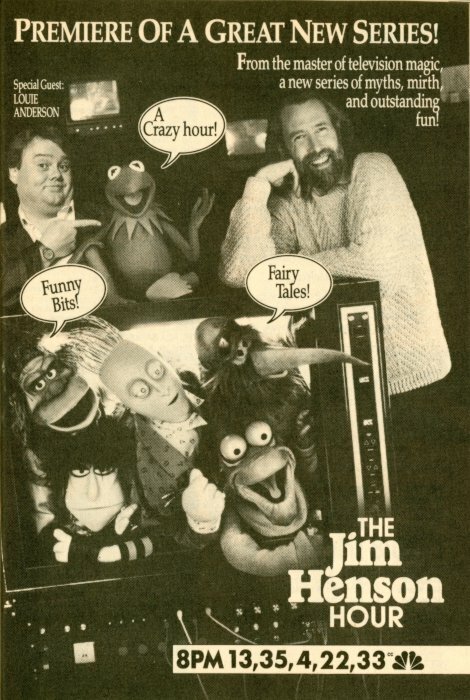 Ad for The Jim Henson Hour on NBC | Copyright 1989 Triangle Publications, Inc. There are two good articles in this issue. David Handler examines the state of cable TV (all 34 channels!) to discover whether paying for cable is worth it. 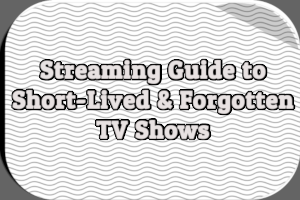 Even with just 34 channels, he only focuses on the “major entertainment” channels: HBO, Showtime, Cinemax, The Movie Channel, The Disney Channel, MTV, A&E Cable Network, and USA Netwrk. HBO and Showtime both have their strengths and weaknesses. HBO offers solid made-for-TV movies, comedy specials, and documentaries. Its original series are “to put it plainly, crap.” Showtime is home to It’s Garry Shandling’s Show, the funniest sitcom on television, but its comedy specials and made-for-TV movies are disappointing. Cinemax and The Movie Channel may not be worth paying for if you’re already paying for HBO and Showtime. Handler very briefly covers TBS, TNT, Nick at Nite, and CBS Family Channel as well. Robert MacKenzie’s article shows viewers how to “squeeze in 17 good hours of viewing per week” and lists 11 different programs. 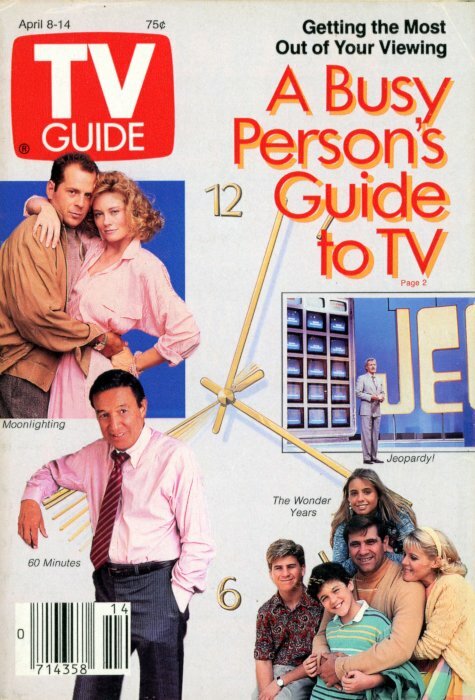 Included are three scripted, network prime time TV shows: L.A. Law, The Wonder Years, and Moonlighting. 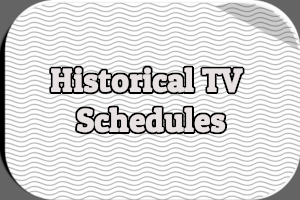 Two PBS shows are also on the list: Wall $treet Week and Nature. He also suggests watching Jeopardy!, World News Tonight with Peter Jennings, and local news every weeknight. 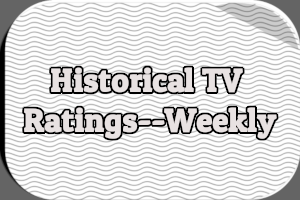 Rounding out the list are This Week with David Brinkley, Sunday Morning, and 60 Minutes. The article about Marlee Matlin is interesting. I had no idea she swore so much in 1989. 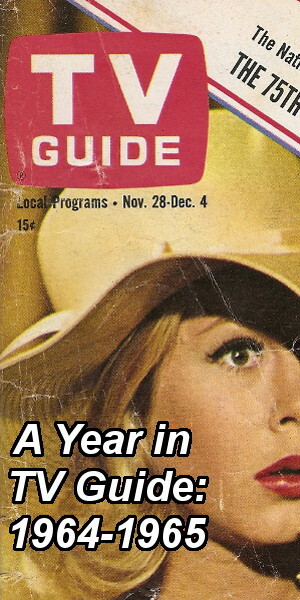 I skipped the articles about Dionne Warwick, baseball, and Dear John (which I’ve never seen). 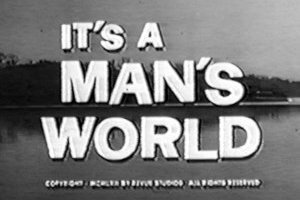 Lawrence Eisenberg’s Grapevine includes tidbits about Stacy Keach’s thoughts on TV violence, Raymond Burr’s greenhouse, and more. Alan Carter shares stories about Joan Pringle, Kathleen Widdoes, and Kurt Robin McKinney in Soaps. Mel Durslag’s Sports View tackles Robbie Knievel’s goal of accomplishing a stunt (leaping the fountains at Caesars Palace) that his father, Evel Knievel, failed to complete. Prices from the Video Cassette Report for movies on VHS: Mystic Pizza ($89.95), Stealing Home ($89.95), Tougher Than Leather ($89.95). Cheers ‘n’ Jeers praises the Frasier-Lilith relationship on Cheers, applauds A&E Network’s As It Happened series, criticizes syndicated War of the Worlds for too much violence, and laments the use of body doubles on TV. Murphy Brown and thirtysomething are great shows, but anyone who’s really in knows the show to watch is Wiseguy. Birmingham says “it is more in to admire the old Star Trek reruns than to follow the tacky new episodes” of Star Trek: The Next Generation. Only if you’re over the hill or an old Trekkie. You might say I am of “the next generation,” having been born in 1965. The old Star Trek reruns are a combination of laughable special effects and a less than realistic captain. The new show is far superior. There are four In the News reports this week. One is a lengthy behind-the-scenes look at ABC’s new sitcom Anything but Love, which recently lost its creator and executive producer (and head writer) Wendy Kout, plus two other writers, due to friction with stars Jamie Lee Curtis and Richard Lewis. Also, a recent poll found that 47% of Americans prefer cable for entertainment programs compared to 27% who prefer broadcast television. On the Grapevine contains four reports this week. First Lady Barbara Bush has taped a public service announcement about combating illiteracy, to air at the end of an episode of Kate & Allie. Also, ABC has renewed thirtysomething for another season. 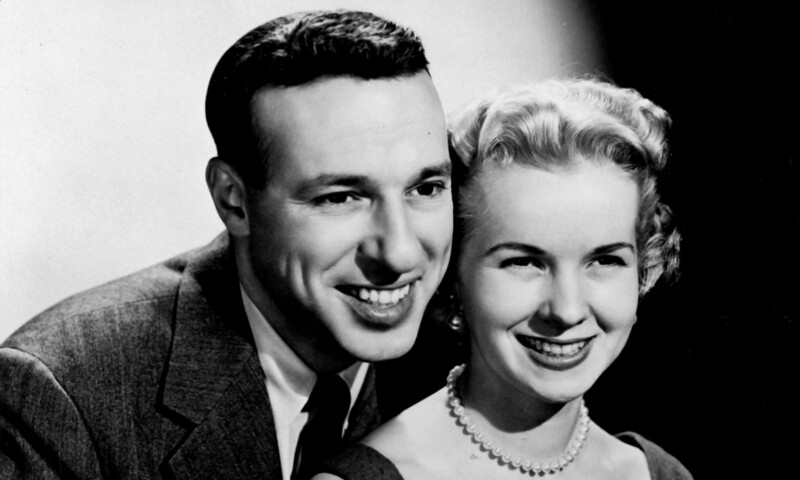 According to The Ratings Race, NBC’s broadcast of the 1960 Peter Pan special won its time slot on Friday, March 24th with a 16.1/27 rating/share. Also, shows like Dynasty, Beauty and the Beast, Hooperman, and Falcon Crest are all “on the fence” for next season. Danny (Tom O’Brien) asks for help in preparing a eulogy for Thomas’s memorial service; Paul (Saul Rubinek) turns up some startling facts while researching an investigative piece for the newspaper; and Steven (Ted Wass) weighs his biological options in hopes of becoming a father. Charlie: Ving Rhames. Peter (David Moscow) has eyes for his clarinet partner (Mimi Rose), who has eyes for Danny (Chris Young), who thinks eying Peter’s partner will raise a jealous eyebrow on Lisa (Lisa Patrick), who keeps a wary eye on the whole affair. Gator: Lightfield Lewis. Matters of life and death occupy the Stafford household when Casey (Kathleen Layman) thinks she’s pregnant and Johnny (Jason Kristopher) gears up to bag his first deer. B.L. : Brian Keith. Gus: Devin Ratray. Kim: Daisy Keith. Debut: Eric Idle plays Grant Pritchard, a spirited spirit who wants to haunt the ill-mannered Dooley family out of his house. In the opener, Grant and his wife (Caroline McWilliams) have a hard time adjusting to the afterlife, but they discover that they can communicate with the Dooleys’ grandfather(Henderson Forsythe). Mike Dooley: Stuart Pankin. Liz: Wendy Schaal. Derek: Jay Lambert. Clerk: Ja’net DuBois. Josh: Jason Zahler. Perkins: Hank Garrett. Girl: Robina Ritchie. Gideon (Louis Gossett Jr.) searches for an archaeologist who was “disappeared” while searching for gold artifacts in a Latin American nation ruled by a tyrant and torn by civil war. 8PM CBS (11) (2D) (7) (10) (15) HARD TIME ON PLANET EARTH (CC)–Adventure; 60 min. Jesse’s win on “The All New Dating Game” pairs him with a woman already involved with a man who dates women in order to burglarize their apartments. Game-show host Jeff MacGregor plays himself. Jesse: Martin Kove. Edward (Robert Guillaume) would like to date Ann (Wendy Phillips) but she still seems to be emotionally tied to her ex (Frederick Coffin). Henry: Hank Rolike. Pamela: Kelsey Scott. Donna: Josephine Premice. A TV news crew shooting a documentary on student nurses disrupts activities at Wilshire Community Hospital; Sam (Chelsea Field) reacts to rumors about Megan’s pediatrician; and Chris (Suzanne Pleshette) warns Dr. Chasen (Doran Clark) not to interfere in her personal life. Megan: Taylor Fry. Becky: Kristy Swanson. Allyson: Kim Ulrich. Garrett: Barry Newman. Nurse Ritt: Fran Bennett. Bridget: Susan Walters. Yolo: Roxann Biggs. 9:30PM NBC (13) (35) (4) (4D) (22) (33) DREAM TEAM (CC)–Drama; 90 min. Debut: Blue-collar life in Hoboken, N.J., flavors this series, which interweaves stories of working-class men and women. 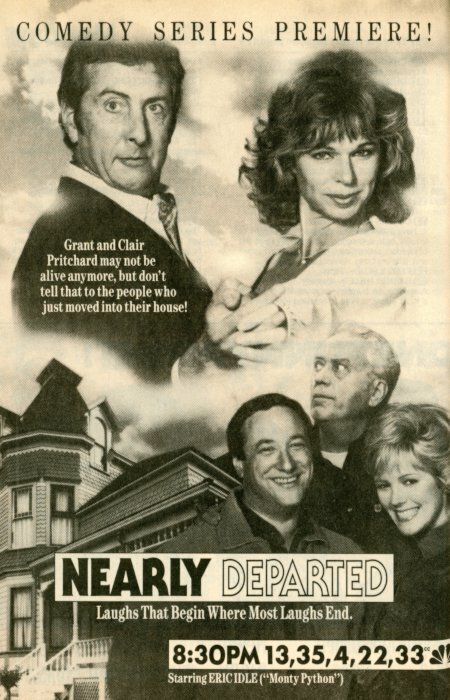 In the opener, Denis Debeau (Dale Midkiff) finds himself at odds with his irresponsible brother Harry (Peter Frechette) when their father (Tom Signorelli) suffers a stroke; mob-connected Joey Coltrera (Thomas Calabro) proposes to his Jewish girlfriend (Cecil Hoffmann); and a school teacher (Jo Anderson) piques Denis’s interest. Lillian: Debra Mooney. Eric: David Barry Gray. Anthony Coltrera: Victor Argo. Fundora: Paul Calderon. Cesar: Charles Brown. Debut: Henson emcees a variety hour that blends skits, songs, and a “storytellers” segment narrated by John Hurt. In the opener, comedian Louie Anderson appears in a skit introduced by Kermit T. Frog, who’s struggling to hold down the fort at “Muppet Central,” where a bank of video monitors displays Muppet programming. Later, Hurt tells the story of “The Heartless Giant,” a medieval tale about a boy prince (Elliot Spiers) who offers friendship to a beastly bully (Frederick Warder). Prince One: Richard Lintern. Prince Two: Simon Adams. Storyteller Dog: Brian Henson. Queen: Gemma Jones. Bootsie: Jennifer Lee. Brad: Andrew Wilson. 10PM NBC (13) (35) (4) (4D) (22) (33) UNSUB–Crime Drama; 60 min. Two very solid articles? This may be the best issue from 1989 I’ve reviewed yet. That’s it for this issue. 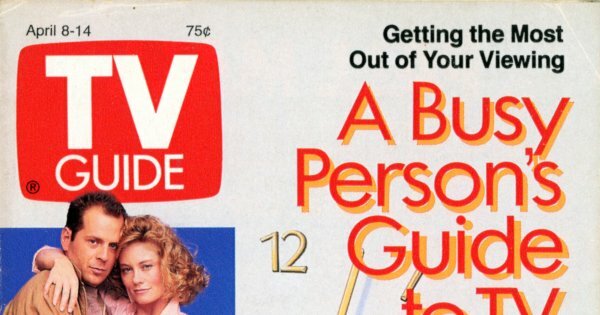 Check back next week for my review of the April 15th, 1989 issue of TV Guide. As always, hit the comments with any thoughts or reactions. I watched NBC’s rerun of its 1960 “Peter Pan” production and taped it (and dubbed it to DVD recently) for posterity, as this was the first time I remember seeing it. Luke Halpin, who appeared in NBC’s FLIPPER a few years later played 1 of the “Lost Boys” here. I remember not particularly liking the 1976 version that starred Mia Farrow & Danny Kaye. You have the incorrect date on JIM HENSON, as it aired April 14, not April 7. I taped & recently dubbed to DVD the NBC special “Sesame St.: 20 Years & Counting”, which aired in the same timeslot on April 7, and I remember its promos for the JIM HENSON show, which premiered the next week. I don’t recall watching the series though. Fixed. I always copy and paste the previous week’s post when I start a new installment and sometimes forget to change the dates. Thanks for the correction.